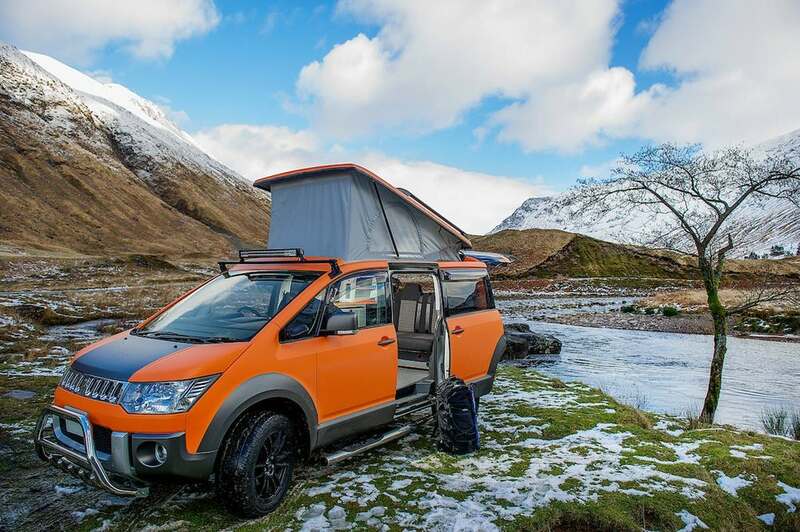 Scottish company Campervan Co. has built its reputation over the last 10 years by building eco-friendly hybrid campers out of Japanese vans under the guise of Campers Scotland. 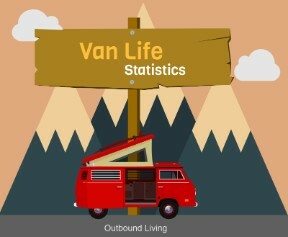 Now they’re rebranding, and launching into the world of off-road vans, but with the same eco-conscious ethos of their years of experience. The Mitsubishi Delica makes a formidable base van for this camper. 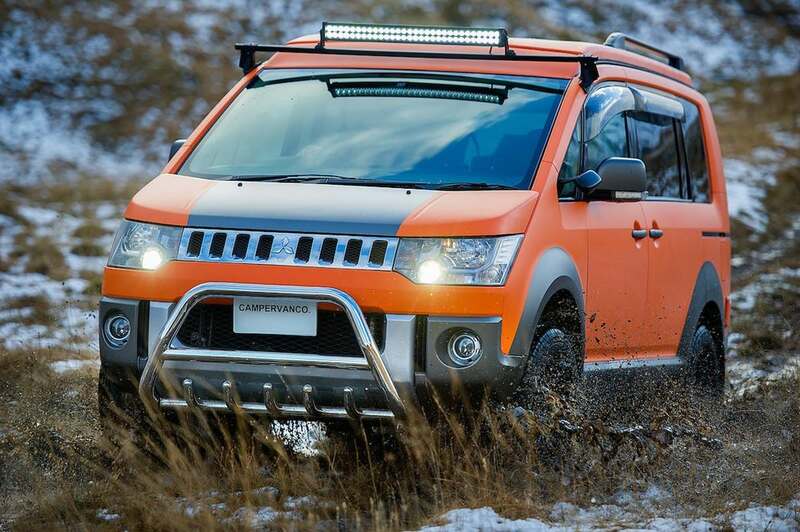 Their latest creation is the 5th gen Mitsubishi Delica-based D:5 Terrain, which does everything its name implies and more. 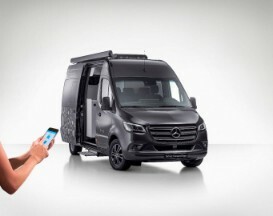 With selectable four wheel drive, a rib-bone frame Monocoque chassis and limited slip differential which can be locked electronically by the user, this van is positively screaming to be let loose off the road. For driving on the road however it can be switched back into front wheel drive mode, and its 2.4L straight-four petrol engine delivers an impressive 168bhp while maintaining 27mpg of fuel economy. A 2.2L diesel engine will be available as an option, although both engines will come with a 6 speed gear box– oh and the bright orange paint is non-optional, but hey, it blends in well with the desert. With its huge ride height and four wheel drive the D:5 can handle any terrain. 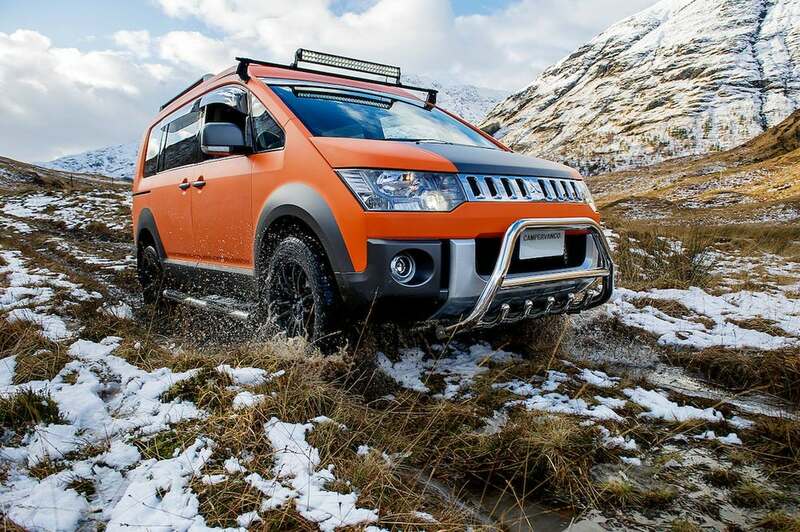 The Mitsubishi Delica also comes with automatic doors, a smart key system and a 2.5T tow bar, and a whole host of extra off-road equipment is available, including skid plates, rock sliders, a bull bar, off-road tires, lifted suspension and a roof rack. All in all this is one of the most compact, adventure-ready machines we’ve seen so far this year, but what’s the interior like? 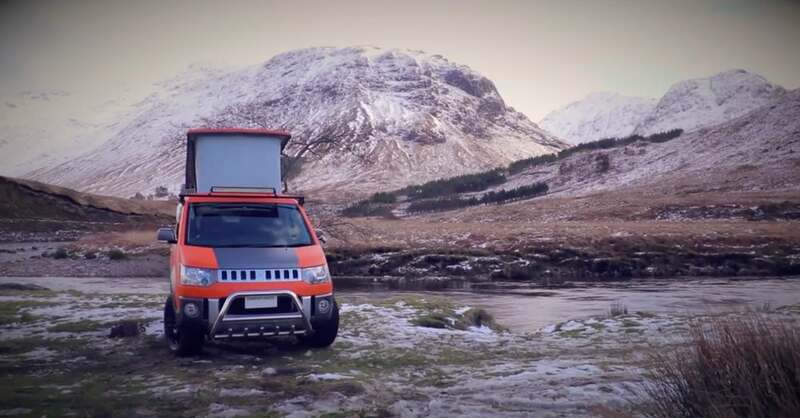 The D:5 Terrain sits right at home in the Scottish Highlands. 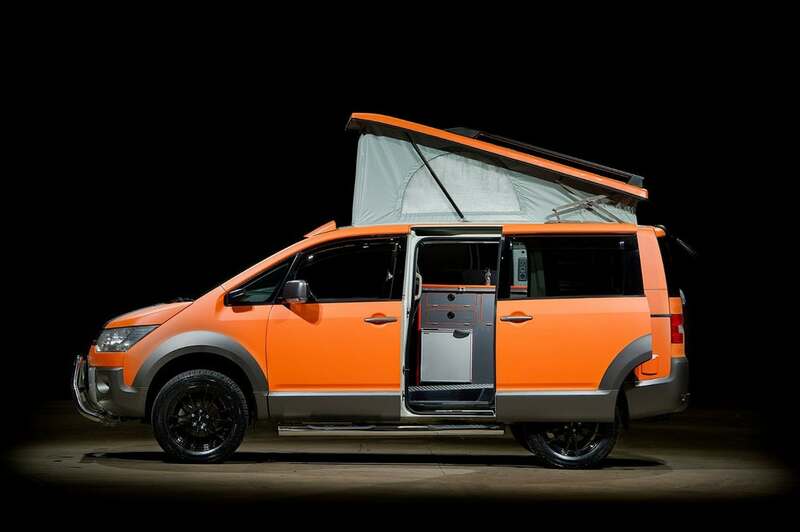 As you can expect, the inside is just as rugged and practical for dirt track explorations as the outside, featuring tough dirt-proof flooring, and a grey and black aesthetic with orange highlights to add a splash of fun. 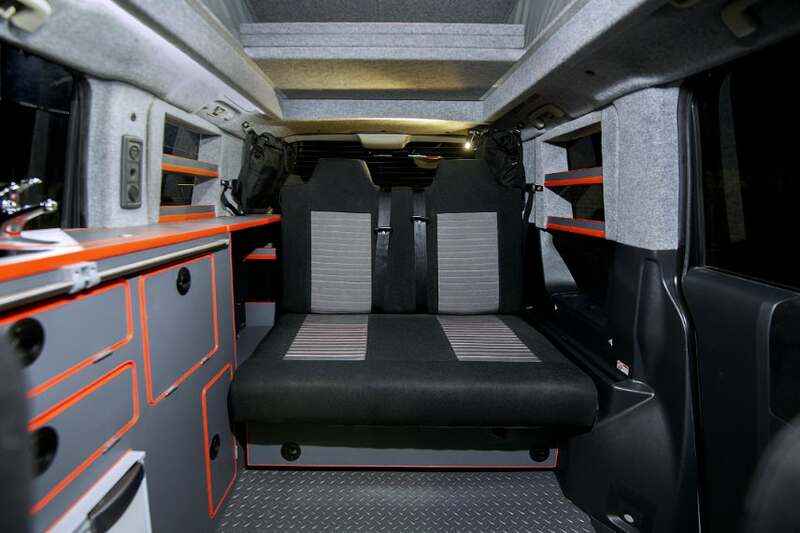 The rear of the van is occupied by a large folding seat which transforms into a bed at night. This makes up part of the dining area too, which centres around a removable table that can be used indoors or out, and driver and passenger swivel seats to create a work or play space for four. 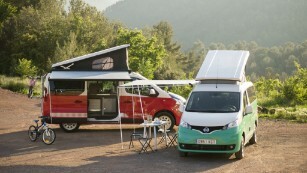 The other two campers can sleep in the pop top roof where they’ll find an additional bed, although due to its tiny size this camper is best suited for a couple. 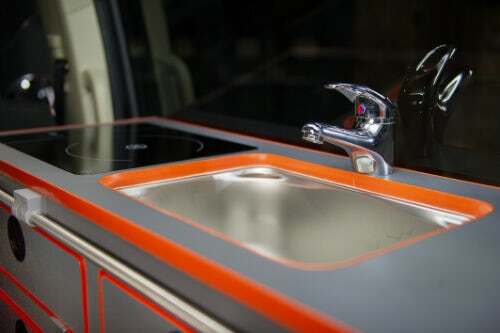 The vibrant orange accents give this camper van a homely feel. The sleek, narrow kitchen contains two induction cooktops that run off the van’s battery, one of which is mounted on an omni-slider to allow for use indoors or out. 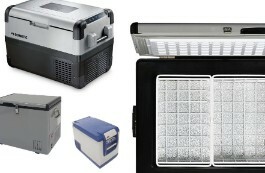 The kitchenette also has a small refrigerator and a sink, as well as many storage compartments for food and kitchenware. A close up view of the D:5’s sink and solar-powered induction hob. A roof-mounted solar panel keeps the D:5’s super-powered Lithium battery topped up, which allows for USB charging for phones and devices. 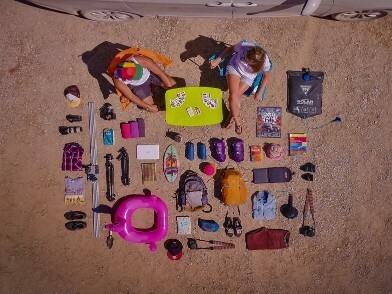 The van is also loaded with neat storage compartments, and removable storage pods which can be attached to rugged rucksacks on day hikes. The D:5 Terrain is a perfect little off-road adventure machine. With its eco-conscious design and enviable off-road capabilities, this little van is reletively affordable, coming in at £27,995 ($36,125). What’s not to love about this awesome Japanese/Scottish fusion?